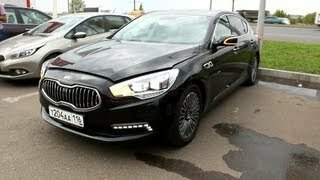 The South Korean automotive market has been recently enriched by one more upmarket sedan, this time coming from Kia and their Kia K9. 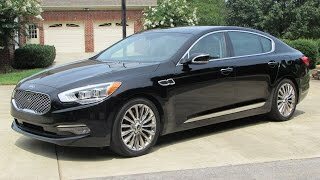 Just to clarify, the Kia Optima and the Cadenza are known in South Korea as the "K5" and "K7" respectively, and admittedly, "K9" is not really a fit name, but not to worry. Once the K9 hits the European auto market it will do so wearing a new name tag. No pun intended. 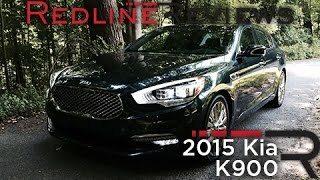 The Kia K9 is currently motivated by a 3.8 liter V6 petrol engine which produces 286 horsepower, but a secondary, direct-injection 3.6 liter V6 unit developing 329 horsepower is expected to join its counterpart in 2013. At this point however, Kia has not mentioned anything about Hyundai's 5.4 liter Tau V8 engine, but if the automaker decides to market the K9 in the US, chances are the beefier V8 engine will be made available for purchase as well. On the other hand it's quite pleasant to learn that the 3.6 liter unit in the K9 has been mated with an 8-speed automatic transmission which sends the engine's power at the rear wheels. The Kia K9 basically a long wheelbase sedan and measures 5,090 mm in length, with a 3,045 mm distance between the front and rear axles. That being said, Kia's sedan provides enough legroom even for the most demanding customers. Other key characteristics of the K9 are the fully adaptive all-LED headlamps and the safety features which include Lane Departure Warning system, radar-based Blind-Spot Detection as well as an Around-View monitor featuring four cameras. On the interior Kia's luxurious sedan offers a 12.3 inch TFT LCD display, a couple of 9.2 inch monitors for the rear passengers, Smart Cruise Control, heads-up display and a 17-speaker Harman sound system. Optional extras (or what Kia calls "VIP option") include ventilated rear seats featuring reclining backrest, sliding cushion as well as leg support, and a front passenger seat that automatically slides forward when unoccupied. As far as availability goes, Kia intends on shipping their sedan in Europe as well but they haven't managed to share any information regarding when exactly it will happen. 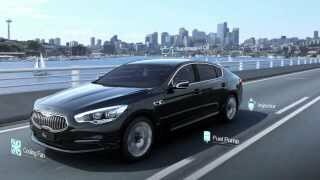 Furthermore, the car maker has not revealed anything about any plans to market the K9 in the US so far, probably because the Hyundai Genesis Sedan has not been very successful in these parts.